This week’s Cameo Card comes from the ever-celebrated 1983 Topps edition. Next to the back to back sets of 1975 and 1976, the 1983 set has got to be in my Top 3 of sets I own. The fact the set has Tony Gwynn’s rookie card may play a large part in that standing, yet, I’ve always loved the color schemes and inlayed head shot. Another great aspect of the 1983 Topps set is the action. I like action on my baseball cards, however, I don’t like cards dedicated to action like those from the 1972 and 1982 Topps releases. To me it pads a set, although it was likely necessary for 1982 because of the strike shortened season that reduced the number of call-ups who could have had 1982 base cards. 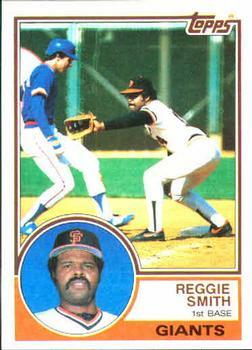 Anyways, back to cameo card…The card is the final edition for Reggie Smith after a long and distinguished 17 year career. Reggie is often overlooked when putting on our rose-colored glasses. Reggie put up fantastic numbers like his 314 round-trippers, 2,020 hits and .287 lifetime batting average. He also wasn’t too shabby with the mitt, winning a Gold Glove and appearing in seven mid-Summer Classics. Also featured on Smith’s card is a young, scrawny Ryne Sandberg (Is a Trifecta in play?). I distinctly remember this card being sold at card shops and shows solely for the fact that Ryne Sandberg was in the photo. I guess it’s the first Cameo Card I became aware of. I researched the box scores, and couldn’t figure out when this game occurred. Too many match ups between these two teams with both playing, as well as the fact that Sandberg could have been on-base due to a hit, a walk, an error, a fielder’s choice, etc., which made it impossible to Name the Game. So all you Sandberg collectors out there, you might want to go land yourself a 1983 Topps Reggie Smith to round out your player collection!